Algebra is when most children get introduced to the concepts of “abstract” mathematics. Suddenly their world gets involved in quantities like “x” and “y”s. And if not introduced properly it can lead to fear of the subject. But if taught properly they can see that the “x” and “y” are like words that form a beautiful poem and they’ll delight themselves when they learn this secret language and understand the beauty of algebra. Understanding and practice can go a long way in helping children here. Sites like EduGain (www.edugain.com) can help children in doing this. Let’s look at a simple problem that can illustrate the beauty of this language (adults may like it too). Note that this article is meant only for children studying in grade 6 and above. Suppose you take a long, really long string. You then cut out enough of it so that it can go all the way around the earth (I told you it was really long). 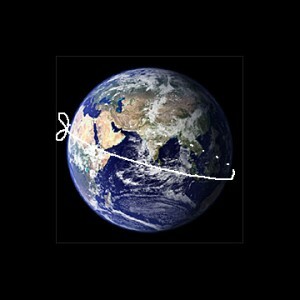 So now you have this string that’s on the ground and encircling the earth along the equator.Now suppose you add another 30 centimeters to that string (that’s about the length of your long ruler). We then smoothen it out by pulling it up from the ground all over the equator so that it forms a proper circle again. We know that the circumference of a circle is C = 2 x ? x R, where R is the radius. Now we don’t know the exact radius of the earth here, but we don’t need to. Let’s leave it as a symbol R. So the length of the original string = 6 x R. We’ll just call it 6R (and know it means the value of R, whatever it is, multiplied by 6). Now we added 30 cm to C. The length of the new string is now C+30. What we need to find out is how much R increases. Rnew = R + Z (remember we already assumed R increased by a length Z which we are trying to find out). C + 30 = 6(R + Z). Amazing isn’t it. The new string would be 5 cm above the ground all everywhere. Just by adding 30 cm extra. Very interesting and well written article for kids. My daughter liked it, can you also write similar article on geometry. Nice work, I am waiting for more posts like this. awesome blog with superb content. this is a exceedingly nice weblog! Hey, possibly this post is not on topic but in any event, I have been browsing about your site and it looks really neat. It is easy to see I am creating a new blog and I am struggling to make it look great, and supply excellent subject matter. I have learned a lot here and I look forward to additional updates and will be returning. Hi, i must say fantastic site you have, i stumbled across it in AOL. Does you get much traffic? I must say this article was very interesting. I found you with a google search and was rather impressed by your rank for this article. I really like what you have acquired here, certainly like what you're stating and the way in which you say it. Very good written article. It will be helpful to everyone who usess it, including myself. Keep up the good work - can'r wait to read more posts. Any way I'll be coming back and I hope you post again soon. IMHO you've got the right ansewr! Great tihnnkig! That really breaks the mold! In awe of that answer! Relaly cool! Real brain power on display. Tahkns for that answer! I do agree with all the ideas you have presented in your post. They are very convincing and will definitely work. Thanks for the post. Thank you for the sensible critique. Me & my neighbor were just preparing to do a little research about this. We got a grab a book from our local library but I think I learned more from this post. I am very glad to see such fantastic info being shared freely out there. Posts like this birghetn up my day. Thanks for taking the time. Back in shocol, I'm doing so much learning. Extremely fantastic information could be found on web site. I will give this blog a A+ so helpful! I ran into this page on accident, surprisingly, this is a great website. The site owner has done a great job writing/collecting articles to post, the info here is really insightful. You just secured yourself a guarenteed reader. You have a great blog. Keep It Up. Great write-up, I am regular visitor of one's website, maintain up the nice operate, and It is going to be a regular visitor for a lengthy time. You know what, I just love this subject and am fascinated by the way you have put up this article. I prefer, you should be putting more articles so that many other students can get interest in mathematics. It was fascinating reading it. I also love Algebra and I am trying to learn it by heart. this is a very good topic to express algebra to the beginners like me. Great, keep writing such good articles.